For an album that brings up such nostalgia for the days of swords, ships and ancient gods, Jumalten aika feels strangely timely. It isn’t so much that they’ve updated or modernized their sound; there is simply an arresting focus, a firm spine around which this album has been tightly wound. 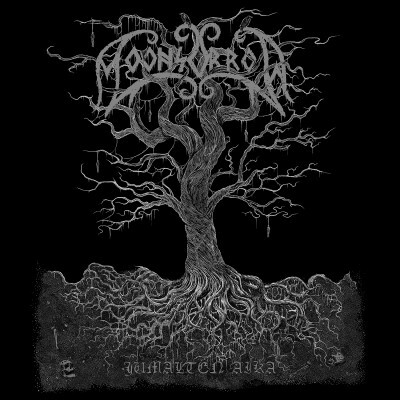 Moonsorrow have truly outdone themselves with Jumalten aika—not by making even grander gestures than those on Verisäkeet or Viides luku – Hävitetty, but by honing down to the true essence of black and folk metal. The resulting album has an intimacy—and immediacy—that would be a rare find in any band’s discography, but is especially unexpected from a band that has always painted with the broad brushstrokes of fjordtop chants and sweeping walls of sound. Of course, there’s still plenty of the epic-scale vaunting on this record, and nowhere is that more apparent than on the title track. “Jumalten aika” opens with the quiet rolling of waves, the low rumble of skin drums and a dissonant flute. Then comes a low, murmuring chant, like an ancient war song whose words have drifted away to lands beyond the reckoning of mankind. The guitars charge in with the melody and bring it to the forefront of the song, and though it’s a subtle move, the guitars have taken on a more central role here. Moonsorrow have always played immense, unconquerable riffs, but the guitar had always felt like part of the ensemble rather than a principal instrument. Here, it takes on a whole new character—often leading even Henri Sorvali’s symphonic synths. From here, the album delves deeply into a dark, stripped-down style that evokes some of the harsher moments of Suden Uni and Voimasta ja Kunniasta. Instead of relying on the immense orchestration that has become so synonymous with Moonsorrow, the band has achieved a similar sense of scale without it. I anticipate that fans will be divided here, but this lack of extravagance evidences a deeper understanding of what makes their sound so powerful. The band’s confidence in the expressive powers of their instruments shines magnificently throughout Jumalten aika, but the daring starkness of “Ruttolehto incl. Päivättömän Päivän Kansa” and “Suden Tunti” lend contrast to the stunning climax of the record. Up until this point, my first listen had been a pleasant one. After all, Moonsorrow’s gambit seemed to be paying off, revealing some of the best music they’ve ever recorded. However, nothing could have prepared me for the one-two punch of “Mimisbrunn” and “Ihmisen Aika (Kumarrus Pimeyteen).” Leading into the end of Jumalten aika, these two songs underscore the true genius of the songwriting on this album. The more direct interplay of male choir, rock band and traditional folk instrumentation provides several incredibly memorable moments in “Mimisbrunn,” including the haunting, atonal tremolo riff that fades off into the end of the song. “Ihmisen Aika (Kumarrus Pimeyteen)” then erupts into a pounding, savage riff, one that provides a rhythmic backbone for the entire song. Here, the band holds nothing back. All pretense of the barebones sound is cast away, as if it were but an elaborately crafted frame for the true masterpiece on display. The soothing male choirs devolve into late-era Rotting Christ barks, and coupled with the surge of orchestration, “Ihmisen Aika (Kumarrus Pimeyteen)” becomes a 16-minute-long climax, releasing the pent-up tension that Jumalten aika had been building all along.